Measure mommy's tummy or B is for Belly, lets you get up close and personal with the special guests bump. Guess mommy belly size baby shower game is one of those long standing traditional shower games that has withstood the test of time. People are often fascinated with a woman's baby bump. That is why this game will name be played out. I must warn you though that not all women like to be prodded and touched and measured so be sure that mommy is comfortable with having her belly measure before playing this game. Pass around rolls of toilet paper, yarn or any measuring material you choose to use. Tell all the guests that they should take as much as they think will fit around mommy's belly. 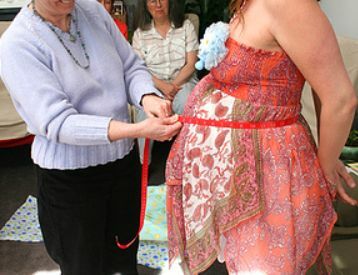 The hostess will then measure mommy's belly herself and compare it to those of the guests. The person that has the closest measurement of mommy's belly size is the winner. If mom to be is comfortable and if there are not a lot of guests then ask each person to step up to mommy and measure mommy's belly with their toilet paper. The person that has the closet fit wins. You may also write down on paper you name and what you think is the belly size in inches. The hostess will use a tape measure to see the actual size then go through all the answers and to pick the winner. 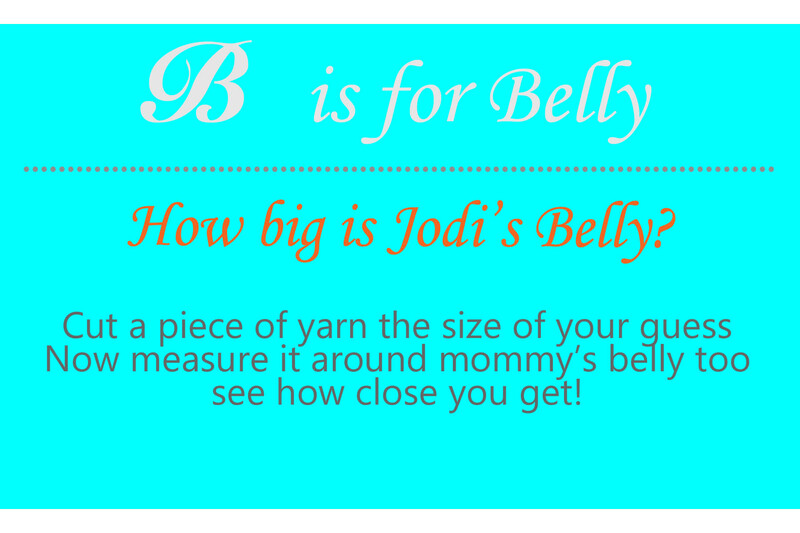 B is for Belly sounds much cuter than measure mommy tummy...right? New name but same concept.